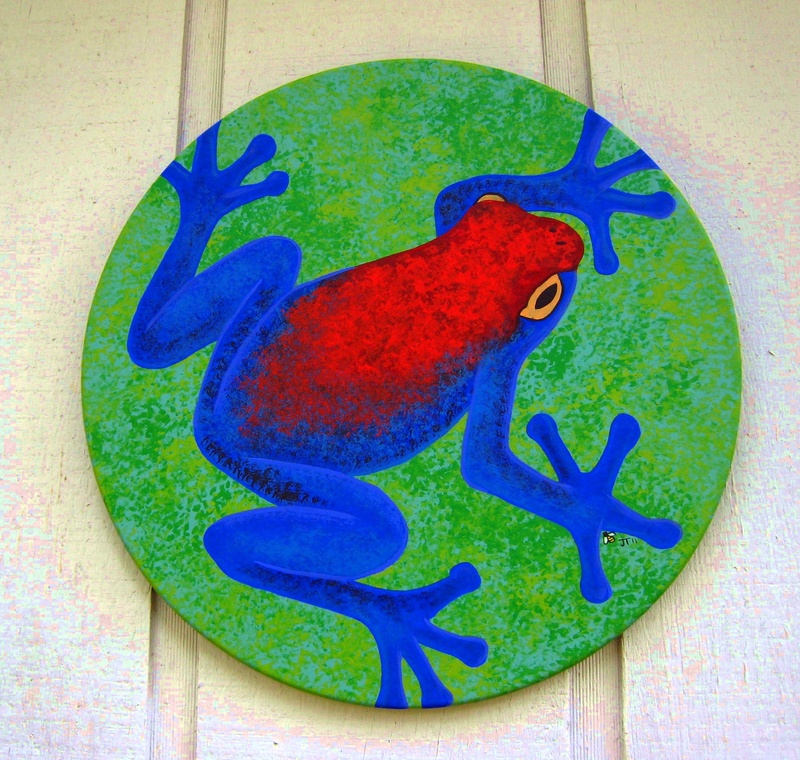 The Redback Croaker is 19” diameter. She is a shy creature, living quietly under the philodendron’s umbrella. Waiting , watching, patiently motionless until the movement of her favorite dietary morsel catches her always observant eye. Yum. What a long time coming this sculpture. Several years actually. Starting with the painted ball at the core and a huge flying ring. Then the oddest bits and pieces from my collected gleanings. 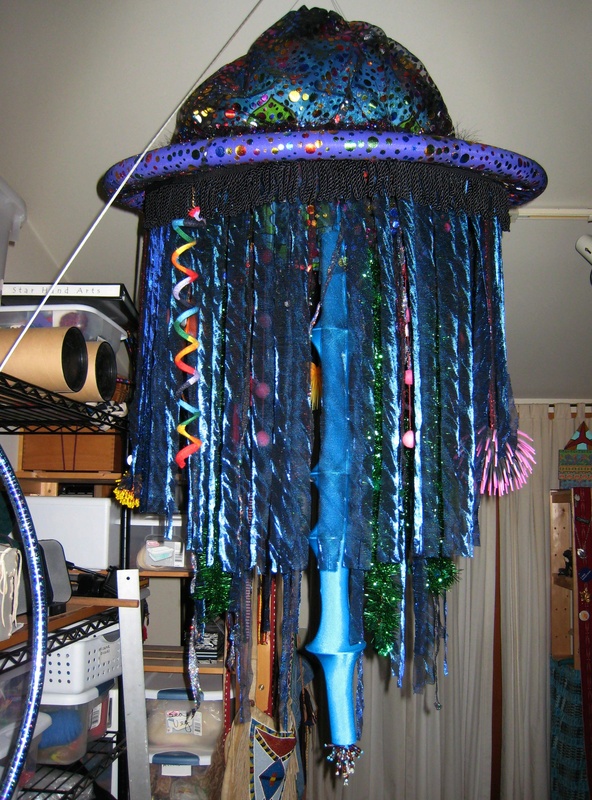 Metallic fabrics, trims, various rubber toys, beaded do dads, constructed sexual organs and a small set of lights woven into the under belly really set off the whole. What is unknown at this point is how to hang and display the thing. It’s 3.0 ft in diameter and 4.5 ft in height. Weighs about 7 lbs. A monster. It has been a fun process start to finish. It has its origin in the world of the Humor Parlor. Every so often a new member to this group of creatures and creations comes forward. It began many years ago, in Wyoming, in a rustic shack in Kelly Wyoming. A dip in the road place out in Teton National Park. The first object in the series was a space ship and since then a wondrous variety of beings has appeared. They come when their time is right, on their own. I have little to say in their appearance. Directions for each seem to spring forth in my imagination and after that, stuff just happens. I wait and listen, then do what I’m told; no other time in my life has this skill ever come easily except with the Humor Parlor. So, follow the muse, where ever it leads. 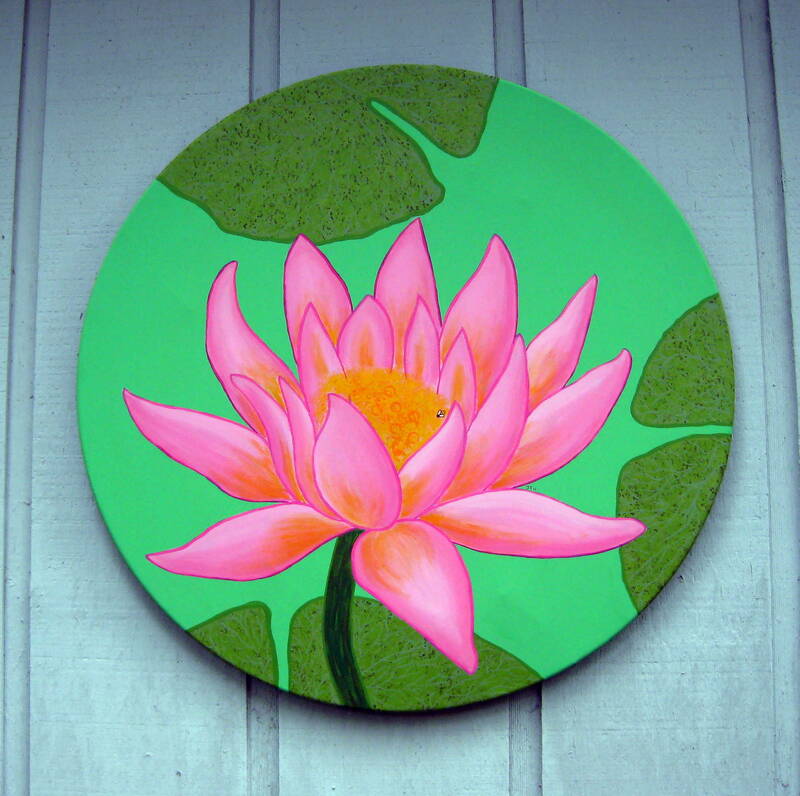 The newest piece in the circle painting, Lotus, is 30” dia. Something about pond life and timelessness, just floating, present, serene, even though all the worldly concerns try endlessly to capture our attention. 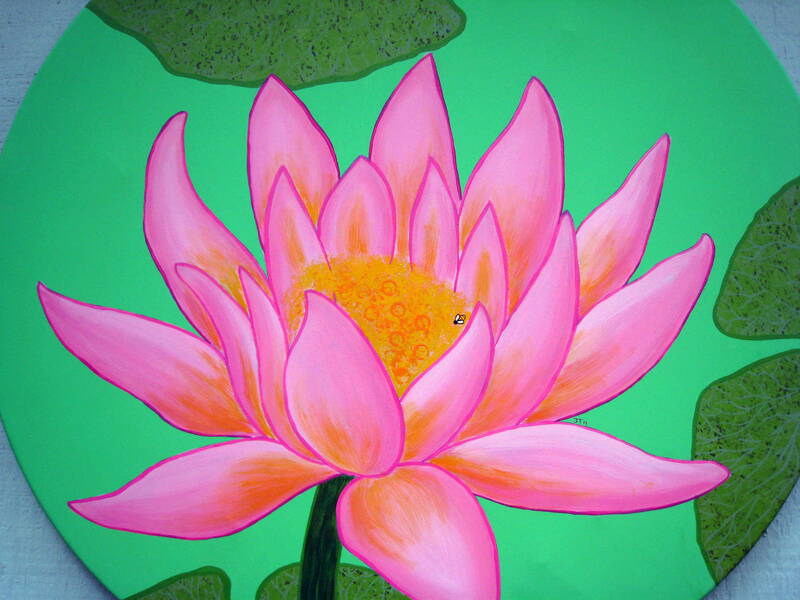 A simple lily is a lily is a lily afloat above the algae bloom, glowing from sunlight through its petals. It indeed looks like every other pond lily but is perfect in its essence and unfolding. Using pink has always been challenge for me and it was with this as well. I feel more warmed by its nature this time around. A better understanding and fit than ever before. 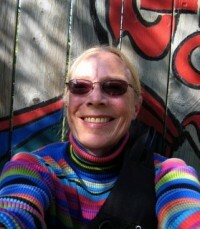 Is it possible that moving through fear happens at every level? This was an aspect of it for me. Then again, publishing my art work for all to see and enjoy has pushed me to know my self more deeply at every level. 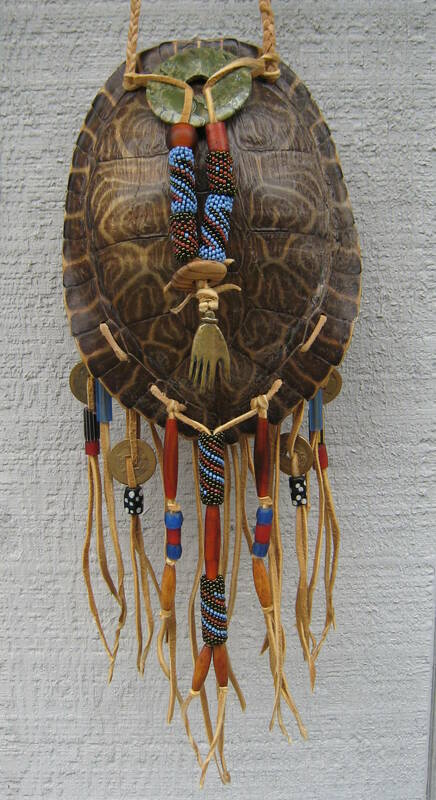 Turtle Shell pouch is 8” in length plus added fringe making it 16” overall. 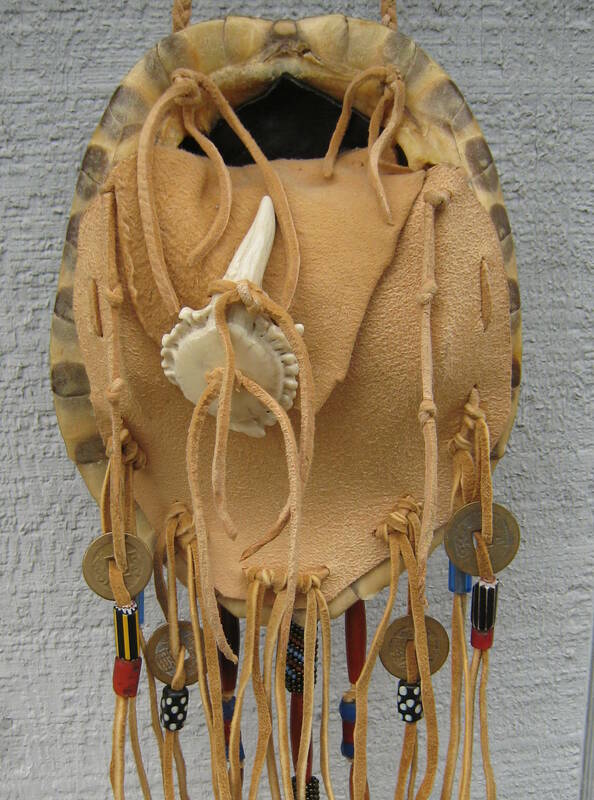 Adornments are, hand made by me peyote stitch beads, antique trade era beads, old Chinese coins, bone and horn hair tube, brass hand, stone disk, wood button and the closure on the belly side, shown on the back detail is a very cool elk rosette. Brain tanned deerskin used through out. This piece has been floating around in the pondering what to do with that beautiful shell space for years now. Being noted but set back on the shelf numerous times because my contemporary work and painting has grabbed the front row of my attention. Well in all its sweetness, she has become herself. Knife and Sheath, hand made by the owner. 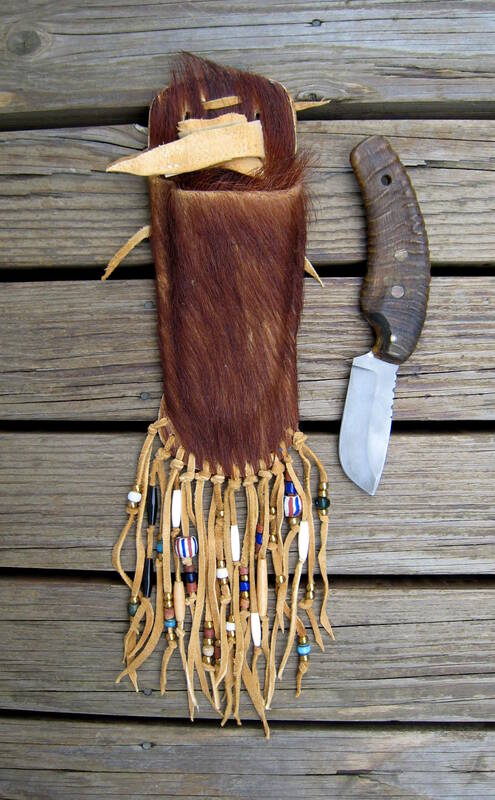 Sheath is Boar hide, 10” in length plus added fringe. He asked me to make some repairs and additions through adornments. Adorned with added brain tan deer fringe and closure to secure the knife itself and various antique trade era beads, brass beads, horn and bone hair tubes. A sweet piece all around.